Windows Update Error Code occurs when your computer is having trouble connecting to Microsoft’s Windows Update server. The error usually occurs before you are actually able to download and install any new updates. Learn two ways to fix Windows Update error code 0x80072efe. What is Windows Update Error 0x80072efe? To download and install Windows updates, your installation of Windows must meet certain criteria so Microsoft knows that you are downloading the updates to a certified copy of the operating system. Oddly, this includes having the correct date and time set on your PC. Without the correct date and time, you can get error 0x80072efe. You must also have a viable connection to the Internet to download updates. Firewalls, virus scanners, and other software you have installed on your PC can get between your computer and the Windows Update servers. Disabling Windows Firewall sometimes fixes the error. You just need to remember to turn it back on when you are finished. Log in to Windows 7 using an account that has administrative privileges. In the lower right of your desktop, note the date and time. If they are incorrect, click on them and then click the link labeled Change Date and Time Settings. You should now be looking at the Date and Time window. Click on the button labeled Change Data and Time. Simply change the date and time to be correct and click the OK button. 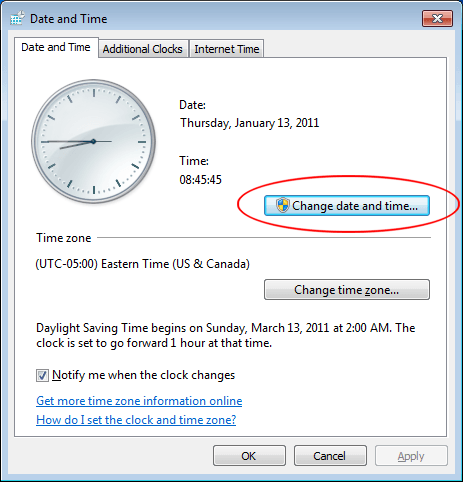 Click the OK button on the Date and Time window and try Windows Update again. If it doesn’t work or if your date and time were correct in the first place, move on to the second fix. Click on Start>Control Panel>System and Security>Windows Firewall to open the Windows Firewall window. You’ll notice that your networks are split into two types. One is Home or Work (Private) Networks and the other is Public Networks. Unless you are connecting to the Internet over a public network in your home, we are only interested in the Private network. On the left hand side of the window, click on the link labeled Turn Window Firewall On or Off. This opens the Customize Settings window for Window Firewall. 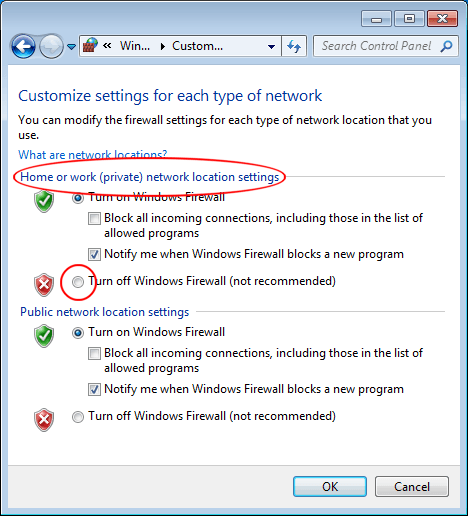 Locate the section of the window associated with the Home or Work (Private) Network Location Settings. 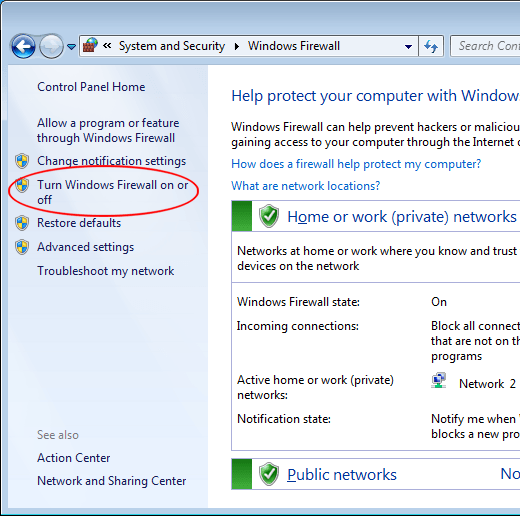 Click the option titled Turn Off Windows Firewall (Not Recommended). Then, click the OK button and close any other windows you have open. Restart your computer and try to connect to Windows Update again. Most people find that one of these two fixes makes Windows Update work again. If it works, remember to turn Windows Firewall back on. If these fixes don’t work, you will have to explore other reasons why you cannot connect to Microsoft’s servers. For starters, disable any virus scanners you have running and check to see if you have any other firewalls running in Windows 7. Disable them one at a time and check to see if Windows Update starts working again. Sometimes your PC will have trouble connecting to Windows Update and return error code 0x80072efe. Usually, an incorrectly set date/time or the Windows Firewall are to blame. Checking your PC’s date/time and temporarily turning off Window Firewall fixes the problem. If not, you will have to look to other reasons why your PC cannot connect to Windows Update such as additional firewall software or overeager virus scanners.